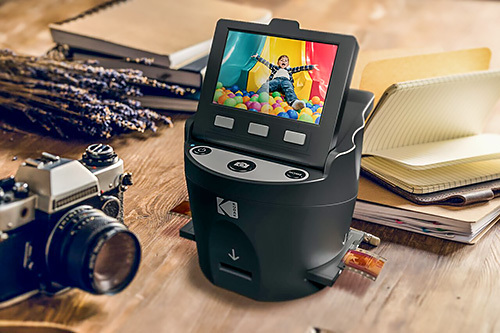 The Kodak Scanza digital film and slide scanner, which has just been released by C+A Global, digitizes a variety of film formats including 35mm, 126, 110, Super 8 and 8mm negatives and slides into optimized 14-megapixel or interpolated 22-Mp digital files. Images are stored on an SD card just as with a camera. "Kodak has a steep heritage in film and, perhaps more importantly, helping people preserve life's precious memories. Many folks have boxes filled with Kodak film ready to be given new life, with no means of doing so," said Joel Satin, vice president of brand licensing at Kodak. "With the Kodak Scanza digital film scanner, reliving these moments and bringing them into the digital world is as easy as scan, save and share." 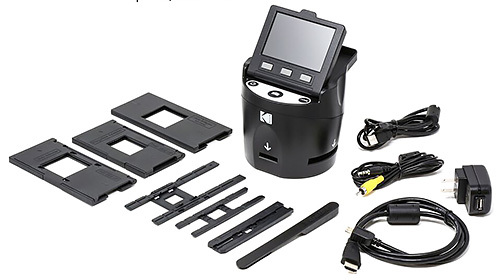 The kit comes a set of film adapters and inserts, the scanner with its built-in 3.5-inch LCD color display and easy-to-use interface, plus multiple cables for device connections. The scanner interface allows you to enhance the image quality of the scan, including the ability to adjust RGB levels and brightness. The scanner's gallery mode can display images in a slide show during which you can rotate, flip and delete images. We've requested a review unit. Meanwhile for more information on the $169.99 unit see the news release below. ROCHESTER, N.Y. and EDISON, N.J. -- Jan. 30 -- Today Eastman Kodak Co. announced the availability of the Kodak Scanza digital film and slide scanner available from its North American brand licensee, C+A Global. The versatile film-to-JPEG converter digitizes a variety of formats including 35mm, 126, 110, super 8 and 8mm negatives and slides into optimized 14-megapixel or interpolated 22-Mp digital files. Images can then be transferred to any Mac or PC via an SD card for saving, sharing, printing and editing. The all-in-one package comes ready to go with everything needed to start scanning slides and negatives: various film adapters and inserts, a built-in LCD color display, an exceptionally easy-to-use operational interface, plus multiple cables for device hookup. "Kodak has a steep heritage in film and, perhaps more importantly, helping people preserve life's precious memories. Many folks have boxes filled with Kodak film ready to be given new life, with no means of doing so," said Joel Satin, VP Brand Licensing at Eastman Kodak Co. "With the Kodak Scanza digital film scanner, reliving these moments and bringing them into the digital world is as easy as scan, save and share." The Kodak Scanza scanner features an intuitive user interface that allows users to enhance the image quality of their film, including the ability to adjust RGB levels and brightness for ideal image coloring. With the scanner's gallery mode, users can display images in a slide show, then rotate, flip and delete images as they see fit. Convert Film to JPEG in Seconds. The Scanza scanner's powerful 14-Mp sensor captures images from 35mm, 126, 110, Super 8 and 8mm negatives and slides in stunning HD clarity, while its optional integrated interpolation setting enhances images up to 22-megapixels. Large 3.5-inch LCD Screen. The high-definition built-in LCD color display features adjustable brightness and convenient tilt for easy operation and image viewing, allowing users to easily edit images using the scanner's various settings. An Adapter for Everything. The Kodak Scanza scanner ships with multiple film inserts and adapters for converting various negatives and slides for fast and flexible operation; it's large one-touch buttons allow for one-step scan and save. Intuitive User Interface. Displayed on the scanner's clear, bright LCD screen, the user interface includes a helpful tray and insert directory, as well as simple-to-navigate image editing capabilities and a gallery for browsing through saved images. HDMI/Video Cables and More Included. The Kodak Scanza scanner comes with everything needed to start scanning images, including HDMI/video cables for viewing images on a television, an AC adapter, USB power cable and a film cleaning brush. The Kodak Scanza scanner is available now for $169.99 on Amazon and comes with a one-year limited warranty.